The final Surly variety pack of 2018 lands this week, and it’s ideally suited to the coming months. MORTAL SUN AMERICAN PORTER: Surly has never made a traditional, straight-up porter in its entire history. A terrific lineup of stouts, brown ales, and hybrids to be sure, but never this classic beer style. When we landed on making a winter-themed variety pack, a porter was a natural fit, and our brew team got to work. Mortal Sun is the result. What you can expect: A welcoming, roast-y sweetness, chocolate and biscuit aromatics, and a nice little pop at the finish from a Willamette dry-hop addition. We brewed it to be enjoyed on those days with 17 bleak minutes of gray daylight and when your last three Amazon orders are for blankets. 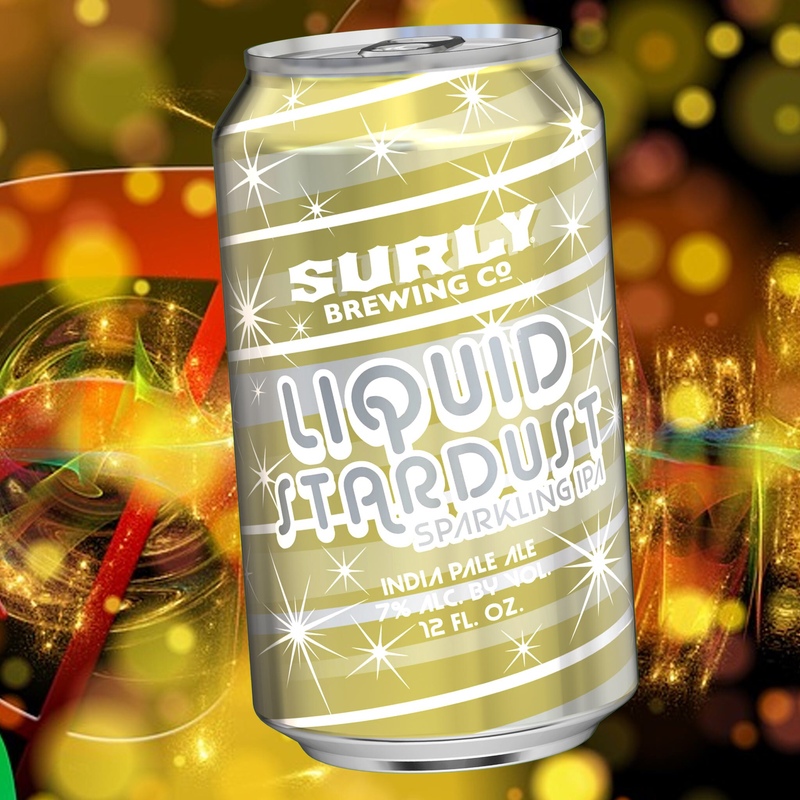 LIQUID STARDUST SPARKLING IPA: Winter isn’t always bleak. We’re from Minnesota, so we know that for every howling blizzard and towering pile of crud and slush, there’s the one good holiday party, or the friends and family you honestly like that you only see this time of year. It calls for a champagne celebration on a beer budget. It calls for Liquid Stardust. What you can expect: All the fruit and citrus notes you’d expect from an IPA with an Amarillo, Citra, and Mosaic hop bill, but with an incredibly crisp and dry finish. Raise a glass. The Frost Pack is available to all Surly markets. P.S. With the holiday season fast approaching for the craft beer lover in your life, the Frost Pack is a very easy gift to wrap and/or just throw a damn bow on. Just so you know. It tastes exactly how it sounds-AMAZING! Ballast Point Brewing Co. in San Diego, California has announced the release of a new Sculpin IPA variant. Spruce Tip Sculpin joins the likes of Grapefruit Sculpin, Habanero Sculpin, Pineapple Sculpin, Unfiltered Sculpin and Aloha Sculpin to the brewery’s stellar original IPA. The beer is available now wherever Ballast Point’s offerings are sold. The full release from the brewery is below. SAN DIEGO — Just in time for fall, Ballast Point, one of the nation’s leading craft breweries, introduces Spruce Tip Sculpin IPA – a seasonal twist on its flagship IPA. The limited-release beer will be available nationally beginning October 1. Sculpin’s complexity shines in this Spruce Tip edition. The addition of Oregon spruce tips, harvested from family farms, brings flavors of pine, red berry, lemon and wine grapes, which complement Sculpin’s citrusy hop profile. On the nose, the spruce tips contribute a unique piney, citrusy and woody character. A great brew for the holidays and beyond, the seven percent ABV Spruce Tip Sculpin is a standout in a forest of IPAs. Spruce Tip Sculpin IPA was inspired by Ballast Point’s “Roots to Boots” R&D program, which empowers employees to brew experimental beers. After growing up enjoying his aunt’s teas made with spruce tips, an employee in the program was motivated to add the spruce buds to an IPA he was creating. The beer yielded such a unique and delicious flavor that the brewers at Ballast Point knew they had to continue experimenting with spruce tips. In a quest to bring a spruce-infused IPA to the market, Ballast Point called on San Diego-based Specialty Produce to source spruce tips from Oregon. The local produce company has sourced fruits, vegetables, and herbs for Ballast Point for more than ten years and shares the brewery’s commitment to quality. “Specialty Produce thinks about their sourcing in the same way we think about barley and hops. Quality always comes first,” said Murray. 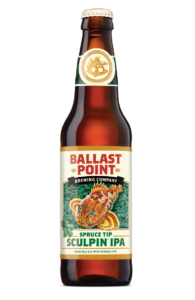 Spruce Tip Sculpin comes off the heels of Ballast Point’s recent spring/summer seasonal release, Aloha Sculpin. The original Sculpin IPA launched in 2005 and has since become the hallmark of the west coast-style IPA, winning gold medals at the World Beer Cup (2010, 2014) and European Beer Star (2010, 2011). The Sculpin family now includes Grapefruit, Aloha and now Spruce Tip. Spruce Tip Sculpin IPA is a fall/winter seasonal release and will be available nationally on draft and in six-pack bottles through February. Launching a boutique adult beverage brand is a story that might normally begin on Madison Avenue instead of Madison, Wisconsin. But Amy Walberg, founder of the new alcohol seltzer beverage brand PRESS, was never one to rest on convention. Amy Walberg founded PRESS to marry her love of seltzer and celebration. Her premium PRESS alcohol seltzers elevate every occasion with a unique blend of natural fruits, fresh spices, and the effervescence of a crisp seltzer. Between professional and personal, Walberg’s travel miles were awe-inspiring. Exposed to far-flung places—and flavors—that would influence the beverage brand she would come to create, Walberg was at the same time crystalizing her personal lifestyle. In 2015, armed with a career’s worth of business insight, she experienced what now seems like a providential moment. Over dinner with a trusted colleague, Walberg remembers musing over the fact that there were limited choices for light carbonated alcohol beverages in the market beyond beer and wine. And as an avid seltzer drinker, Walberg longed for a drink that was a refreshing balance of flavors and effervescence with a touch of alcohol. It was what Walberg describes as her perfect storm—the moment a light-hearted discussion about a lack of beverage choices and an open market niche was spliced with her idea of building a business that would meld professional pursuits with her personal lifestyle and priorities. Finding work-life balance had always been a challenge for Walberg, a single mom with a young son and daughter. The idea of creating a national beverage brand supported by a company reflecting her deeply held values about life priorities, product quality, social responsibility and environmental stewardship was irresistible. That dinner discussion sparked Walberg’s inner entrepreneur and PRESS was, at least in theory, born on a table napkin like so many epic undertakings. The product that emerged was exactly what Walberg envisioned—a lighter, lower-alcohol beverage, appropriate for special occasions or relaxed afternoons on the veranda, with delicate flavors that appealed to those seeking an alternative to wine, beer and traditional malt beverages. But if creating a uniquely flavored alcohol seltzer beverage from scratch sounds like a formidable challenge, going to market in a rising tide of flavored malt and “sweet beer” offerings from the biggest names in the business was doubly daunting. PRESS may have been one of the first fruit and spice infused alcohol seltzers in the market, but Walberg knew the competition would be closing that gap quickly. The pressure was a catalyst for Walberg. The next two years really was the stuff of Madison Avenue— researching flavors and markets, crafting and testing formulas, sourcing manufacturing, packaging and distribution solutions, all while simultaneously fleshing out the operational and business models. She was on the path to create the finest premium alcohol seltzer on the market, and if long hours and relentless testing were the cost, unparalleled taste would be the reward. Fast-forward to 2018—PRESS is on the shelves in XYZ markets, sales are climbing at an average XYZ percent and Walberg’s fledgling brand is fast becoming what she calls “a real contender.” Now in its 3rd year of production, PRESS is currently concentrating on supplying a growing network of retailers, distributors, wholesalers and partners while expanding into new markets like Salt Lake City, Chicago, Buffalo and Boston. Comparatively low calorie and carbohydrate counts and the unique seltzer, no-aftertaste fruit-and-spice flavor experiences are winning combinations, and Walberg is expanding flavor profiles beyond already popular and exotic selections like pomegranate ginger and grapefruit cardamom.